There is an impressive range of bridges in Scotland, many of which were designed by Scots and built by Scottish construction companies. In this, the Year of Innovation, Architecture and Design 2016 it feels fitting to take a look at some of the country’s most iconic bridges, including the Forth Bridge and Glenfinnan Viaduct, and delve a little into their history. Best viewpoint: Car park opposite Tigh an Truish, Isle of Seil. Photograph in early summer to get a shot of the bridge when it’s laden with purple fairy foxglove flowers. How to get there: By bus from Oban, or by taking the A816 south from Oban and turning off onto the B844. History: Built in 1792, Clachan Bridge crosses the Clachan Sound, but is known by the much grander title of ‘The Bridge Over the Atlantic’ because the sound opens directly into the Atlantic Ocean. It was designed by John Stevenson, whose family founded Oban, and the plans were revised by Robert Mylne. Wee fact: Tigh an Truish, is an inn by the bridge and its name translates from Gaelic to mean ‘House of the Trousers’. When Highland dress was banned in 1746 islanders started using the inn to change from kilts into trousers before they visited the mainland. Best viewpoint: From the bridge on the B7024, upstream from the Brig o’Doon. How to get there: Follow directions to the Robert Burns Birthplace Museum. History: This 15th century cobbled bridge in Alloway is the only one on this list that is famed for its appearance in poetry. The Brig o’Doon saved Tam o’Shanter in Robert Burns’ poem of the same name. The witches from Alloway Auld Kirk were pursuing Tam when he crossed the bridge on horseback but were unable to cross the water, and only managed to rip off the poor horse’s tail. Wee fact: You might also recognise the Brig o’Doon from some Scottish £5 notes, and the bridge also lends its name to the musical and 1954 film Brigadoon. Best viewpoint: Photographs well at night, view from Bell’s Bridge upstream on the River Clyde. How to get there: The bridge crosses between Govan Road and Finnieston Street, use travel information from the Scottish Exhibition and Conference Centre. History: Better known as the ‘Squinty Bridge’ due to its twisted arch, the Clyde Arc has graced the River Clyde since 2006. Designed by Edmund Nuttall Ltd and engineered by a team including Halcrow and Gillespies, its construction was part of a huge regeneration project on the Clyde Waterfront. Wee fact: It’s just one of 21 bridges that span the River Clyde, with the earliest bridges dating from the 1850s. They are diverse in style and each plays a part in telling the story of how Glasgow formed to be the city it is today. Best viewpoint: From the river bank adjacent to the bridge, or from the modern bridge over the A941 to the east. How to get there: The bridge is located north of Aberlour, just off the A941 and the A95 and can be reached by public transport. History: The Craigellachie Bridge opened in 1815 and is the oldest surviving cast iron bridge in Scotland. Designed by Thomas Telford, one of the most famous engineers of his time, it has mock-medieval towers that flank the bridge on either side which give it a regal air. Wee fact: It is one of only a few engineering projects in Scotland that has been recognised as a landmark of importance by both the American Society of Civil Engineers and the Institution of Civil Engineers. Best viewpoint: South Queensferry and the Forth Road Bridge are just two of the top viewing points. How to get there: Various forms of transport can be used to reach the bridge. History: The Forth Bridge is recognised the world over as an impressive feat of engineering. At 2.5 kilometres long it still holds the record as the world’s longest cantilever bridge. It opened in 1890 and was designed by Sir John Fowler and Sir Benjamin Baker. It’s a UNESCO World Heritage Site and was recently chosen as Scotland’s greatest manmade wonder. Regularly inspiring artists, photographers and filmmakers, its likeness features in the popular Grand Theft Auto San Andreas computer game and has appeared on both £1 coins and £20 notes. Joined by the Forth Road Bridge in the 1960s, it will gain another sibling in 2017 when the Queensferry Crossing opens. Wee fact: Although once famous for being repainted endlessly, its current topcoat should last until at least 2031. Best viewpoint: From the Glenfinnan Viaduct Trail. How to get there: Take public transport or follow the A830 to Glenfinnan, the viaduct can be reached on foot, or crossed by train. History: When it was completed in 1901 the Glenfinnan Viaduct was longest mass concrete viaduct in Britain. This 1,248 ft (116 m) long crescent-shaped viaduct uses 21 arches to support the railway line 100 ft (30 m) above the River Finnan. It was built by rail and road engineer Sir Robert McAlpine – little did he know that just over 100 years later the bridge would feature in the film adaptation of Harry Potter and the Chamber of Secrets, or that it would also be included on £5 notes. Best viewpoint: At the XIIth Submarine Flotilla 50th anniversary memorial carpark on Garbh Eilean, to the north side of the bridge. How to get there: Travel to Kylesku on the A894, north of Unapool – seasonal buses can be used in summer. History: Replacing a long running boat service, Kylesku Bridge was completed in 1984 and is one continuous concrete curve that crosses Loch a’Chairn Bhain. The previous ferry services had proved unpredictable, especially in bad weather, and the award-winning bridge helped travellers to avoid a 100 mile route on land. Wee fact: The bridge is located in the North West Highlands Geopark on the North Coast 500 driving route, close to Eas a’Chual Aluinn – Britain’s tallest waterfall. Best viewpoint: From Drygrange footbridge, just south of the viaduct. How to get there: Turn off A68 just south of Leaderfoot – public transport is available. History: This elegant red sandstone viaduct opened in 1865 and was created by Charles Jopp and Wylie & Peddie. Its 19 red sandstone arches carried the Berwickshire Railway over the River Tweed and although there was flooding damage to the line in 1948, the Leaderfoot Viaduct was in use until 1965. You can take an 8.5 mile circular walk which includes the viaduct, as well as Melrose, Newstead, Gattonside, Earlston. Wee fact: The tallest arch is a lofty 37m above water level. Best viewpoint: Travel from Kyle of Lochalsh in the direction of Skye Bridge and follow signs to The Plock. It’s a short walk from here to great views of Skye and Lochalsh. How to get there: Follow directions or use public transport to reach Skye Bridge via the A87. History: In 1995 Skye Bridge replaced a ferry route which had been serving the Isle of Skye since the 1600s. Created in a public private partnership by the Miller Group, with Dyckerhoff & Wildmann and Ric Russel, the road bridge carries the A87 and connects Skye to the mainland via the island of Eilean Bàn. The original toll fare for crossing the bridge was highly controversial until all bridge tolls in Scotland were abolished in 2004. Wee fact: Eilean Bàn remains a haven for wildlife, and you can find out about the island otters and the connection with the wildlife author Gavin Maxwell at the Bright Water Visitor Centre in Kyleakin on Skye. Best viewpoint: From the southern bank of the river, which can be reached via an underpass from Wallace Street, or by crossing the bridge from Bridgehaugh Road. Can also be viewed from Stirling Castle. How to get there: Use public transport or follow directions to the bridge from the M9 in Stirling. History: Although the original timber bridge from the famous 1297 Battle of Stirling Bridge no longer exists, Stirling Old Bridge stands just downstream and replaced the earlier timber crossings. Steeped in history, Old Stirling Bridge was built in the late 1400s or early 1500s by Murdoch, Duke of Albany. One of its arches was blown up by General Blackney in 1745 in an attempt to prevent Bonnie Prince Charlie’s Highlanders from crossing the River Forth. Wee fact: Gallows were erected on the bridge to hang Archbishop Hamilton in 1571. Best viewpoint: The course is public and the most popular vantage points for the bridge are behind the 18th green and 1st tee. Sundays are the best day to visit for photos, when golf is not played. How to get there: The course is located adjacent to the famous Royal and Ancient Clubhouse, near Old Station Road in St Andrews. History: The Swilcan Bridge (also known as Swilkin, Swilken and Golfer’s Bridge) might be small in size, but it’s an iconic part of golfing history and a mecca for golf fans. This stone footbridge crosses over Swilcan Burn, which meanders across the 1st and 18th fairways of the Old Course in St Andrews. It has witnessed 29 Open Championships in its time and been privy to some of the finest moments in golfing history. Jack Nicklaus played his final round of professional golf here during the 134th Open Championship in 2005 and waved an emotional goodbye from Swilcan Bridge. Take a walking tour or follow the family trail to find out more of this course’s fascinating history. Wee fact: You can take a walking tour or follow the family trail to find out more of this course’s fascinating history. Best viewpoint: From the car park on the B946, just off Tay Bridge Roundabout in Fife. How to get there: Travel to Dundee where the bridge enters the city from the south, carrying the A92 from Fife. History: The Tay Road Bridge, which turned 50 in August 2016, is around 2,250 metres (1.4 miles), making it one of the longest road bridges in Europe. 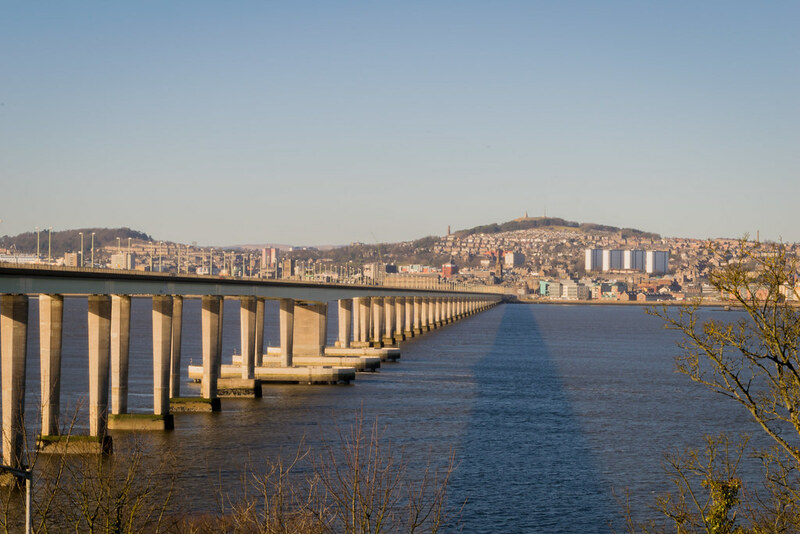 Designed by Glasgow-based William A. Fairhurst, this concrete bridge created an important commuting corridor between Dundee and Newport-on-Tay. Unusually, the pedestrian pathway runs through the middle of the two lines of traffic and is raised above them. Perhaps the most famous bridge to Dundee was the ill-fated Tay Bridge which was completed in 1878. It met a tragic end on 28 December 1879 when it collapsed during a violent storm, sending a passenger train into the water below. The Tay Bridge Disaster Memorials can be visited on either side of the Tay. Later William Henry Barlow redesigned a sturdier Tay Bridge which was built by William Arrol & Co using steel. It remains in use today. Wee fact: Her Majesty Queen Elizabeth the Queen Mother was in the first car to cross the Tay Road Bridge on the day it officially opened. Not seen your favourite Scottish bridge on our list? We know this isn’t an exhaustive list, so we’d love it if you could ‘bridge’ some of the gaps! Which are your favourite Scottish bridge? Let us know in the comments below or vote in the poll over on Scotland’s iKnow Community.